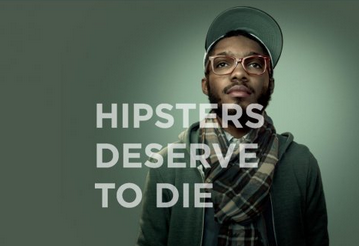 Posters and billboards began popping up in major American cities last week proclaiming that “Hipsters Deserve to Die.” Sort of shocking to say the least. Also named as “deserving to die” are: the tattooed, cat lovers, the genetically privileged, crazy old aunts and various other niche groups. Each poster uses a photo portrait to demonstrate the labeled persona. Click through the tabs above to see the work. This has been upsetting some people in cities like Chicago where people tore down the posters in anger. ”I think that’s very offensive to people who are animal lovers,” Shelli Williams told the Chicago CBS station when first shown the cat lovers version of the poster. These types of reactions have prompted news coverage already. People seem to be a bit confused as to why anyone would post these types of messages. The campaign was designed by Wisconsin agency Laughlin Constable and the Lung Cancer Alliance “We knew that one would be polarizing,” Laughlin Constable strategy VP Denise Kohnke told a Milwaukee TV station. I positively have all little fragment of it and I have bookmarked your blog.